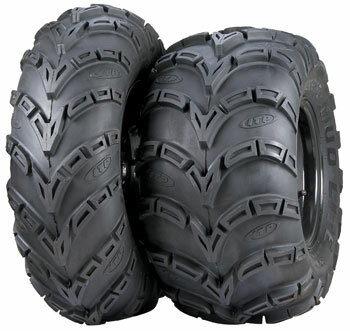 Already one of the most popular tires ever for utility ATV applications, ITP is now bringing all of the famed Mud Lite's features and benefits to the sport quad segment. The all-new Mud Lite SP is sized for use on most late-model, high-performance sport ATVs, in a 22x7-10 front and a 20x11-9 rear. The super-durable, extended-wear, 6-ply Mud Lite SP offers more traction in loose conditions than a knobby tire ever could, yet it provides an amazingly smooth ride and superb cornering characteristics. And it's surprisingly light as well, reducing unsprung weight and allowing that high-tech suspension to maintain its maximum effectiveness. Front: 22x7-10 (6 ply); Rear: 20x11-9 (6 ply).